Just picture a cozy chair sitting by a big wall of windows overlooking a mountian view. 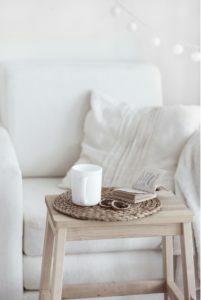 A small side table is setting near the chair with a steaming cup of salted Carmel hot cocoa and a yummy scone beside it. On one of the walls is a cute desk surrounded by bookshelves/drawers. Sitting off to one side of the desk is an adorable turquoise typewriter. Above the desk hangs a large picture of our family. Of course a beautiful journal lies open at the desk with a sharp pencil. A Bible is near by open to the last thing I was reading. And then. There are the book shelves. Two walls of bookshelf. Ceiling to floor. The bookshelves are filled with friends. Words that have helped me through hard things. Words that have helped me learn many things. Words that have helped to form me into who I am today. I’d love to invite you into my book room to have a look at the precious books on my bookshelf…unfortunately that’s not possible, so here’s the next best thing to it.